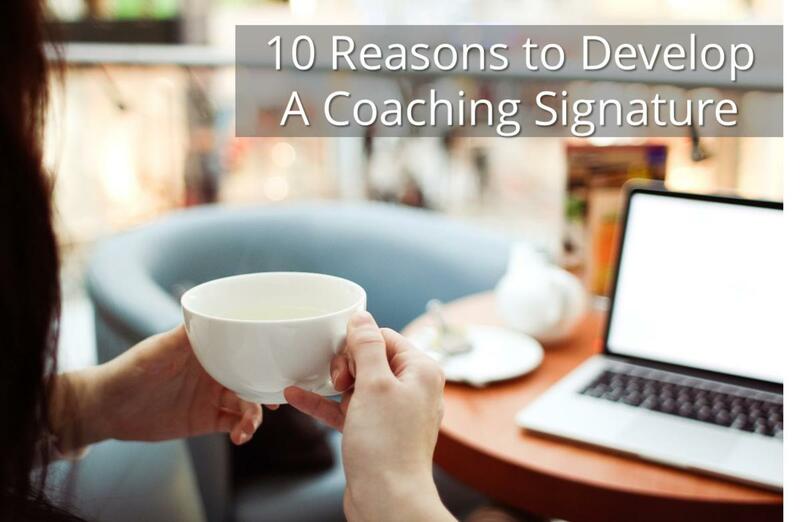 A coaching signature is a distinct process or method that a coach uses to help clients get better results. It includes intellectual property, content and structure, as well as clearly defined outcomes. To get more clients – People prefer products and services that they can get their arms around, both literally and figuratively. Because a signature system can be packaged as a step-by-step system or a variety of tangible products, it’s easier for the customer to understand and buy. To differentiate from other coaches – With a signature approach, you don’t look like all the other coaches; people are more likely to notice and remember you. And you’ve made it easier for people to refer business to you, too. To show that you're a credible expert – Credibility is almost as good as cash to a solo-professional; without it, you have little chance of gaining a foothold in the market. A signature system is one of the best ways to position yourself as an expert. To shorten your sales cycle – How long does it take the average prospect to make their first purchase from you? Most coaches measure this cycle in months or even years if the only thing they have to offer is an expensive, intangible, hard-to-describe service. You’ll shorten the sales cycle significantly when you have a unique system with tangible materials. And you can accelerate it even more by offering a selection of price points and formats (e-books, audio programs, workbooks, etc.). To improve client results – Your clients deserve the best possible results, right? A proven, structured process enhances their success and helps them overcome obstacles faster and more easily, because the right tools and guidelines are at their fingertips. To grow the lifetime value of clients – Happy clients tend to stick around longer; they also spend more and refer more business to you over time. To save time & effort – Having a systematic approach means you don’t have to create a custom-designed package for each new client. Create your system once and then use the materials and structures over and over again. To create more revenue streams – Repackage and repurpose the content of your signature system in different formats: e-books, audio programs, special reports, workbooks, teleclasses, etc. Even the folks who aren’t ready or able to buy the full package can become customers. To make a bigger difference – A coaching system helps you break out of the ‘one-to-one’ coaching model, either through do-it-yourself formats like workbooks and audio programs, or by creating group coaching, teleclasses and workshops based on your signature process. You can help even more people (and increase your profits exponentially!) by having an affiliate program and/or licensing other facilitators to use your coaching system with their own clients. To make your business more profitable – Instead of selling your time by the hour (or the month), now you can offer your expertise in the form of a complete system. This raises the perceived value of your services, which opens up your pricing options. And because the same structure and materials can be used with each client, a signature coaching system costs less to produce and deliver, which means a higher return on your investment of time and energy. Do you want to develop a signature coaching method, but don't know where to start? Download your free guide.